Invite Jean-Jacques' Culinary Creations to cater your wedding or special event at the location of your choice. Whether at your home or other location, we expertly transform any space into a beautiful celebration setting. We often work out of the most challenging spaces. Our professional catering team of event managers, chefs, servers and bartenders will expertly coordinate all aspects your event. Our services include an initial site visit, planning of event timeline, developing floor plan and room design, event set up, complete service, event breakdown, and clean-up. 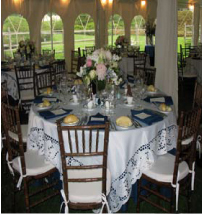 All necessary party rentals including tables, chairs, linens, chair covers with bows, tent and tent accessories can be supplied. All necessary equipment to prepare and serve your event including china, stemware, silverware, chafing dishes, serving trays, coffee urns, portable ovens, refrigeration, and barware are provided. In addition to our premier locations, below is a link that includes other great venues where we can cater your event. These venues include mansions and estates, historic landmarks, parks, museums, and lofts in the tri-state area. 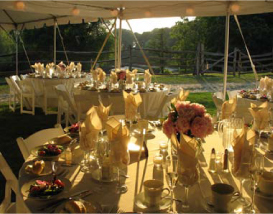 Please contact us at 914.747.8197 and one of our event directors will visit your site and determine with you the overall layout, event flow, rentals, and menu options for your special event.